We are very excited and delighted to be birthing an entirely new concept in the world of eating out. Mike, the god of the studio, has created the first in what will be a long line of Top Lunches cards detailing where's best for grub in our local area. Mike promises this will be the first of many, delivered regularly on a Friday, regardless of how busy he is because he can magic client work away just-like-that. 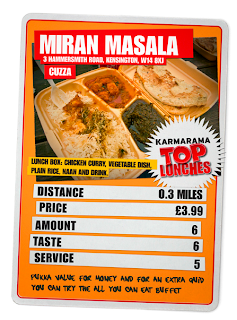 And it's only right and fitting that we launch with the Miran Masala as their curry-in-a-box deal is such splendid value and top nosh that is has us and our widening tums returning time and time again. Finally, we'd just like to say that any similarity between our new Top Lunches cards and a similarly very well trade mark protected brand of popular playing cards is entirely coincidental. The return of Dapper Friday!! Meet Tricia: She's not Scottish, she's better.